Isonokami Futsumitama Shrine (Akaiwa City, Okayama) will hold an Optical Illusion Work Dedication Reporting Ceremony from 13:00 to 14:00 on August 4th (Sat), 2018. The offering to be dedicated is an optical illusion work of Professor Kokichi Sugihara, Director of Meiji Institute for Advanced Study of Mathematical Sciences (MIMS). Situated in Akaiwa City, Okayama, Isonokami Futsumitama Shrine will commemorate 350 years since its re-establishment in 1669 by order of the domain lord Ikeda Mitsumasa. Taking this opportunity, an optical illusion work created by Professor Kokichi Sugihara (Director, MIMS) will be dedicated to the shrine. According to the Nihon Shoki (Japanese Chronicles) completed in 720, Isonokami Futsumitama Shrine stored the sword used by the mythological deity Susanoo to defeat the eight-headed dragon Yamata-no-Orochi. Also, on the Engishiki Jinmyocho (Procedure of the Engi Era – List of Shrines) compiled in 905 by order of Emperor Godaigo, this historic shrine was listed as one of the officially recognized shrines, and ranked second among 128 shrines in Bizen Province (southwestern part of Okayama today). 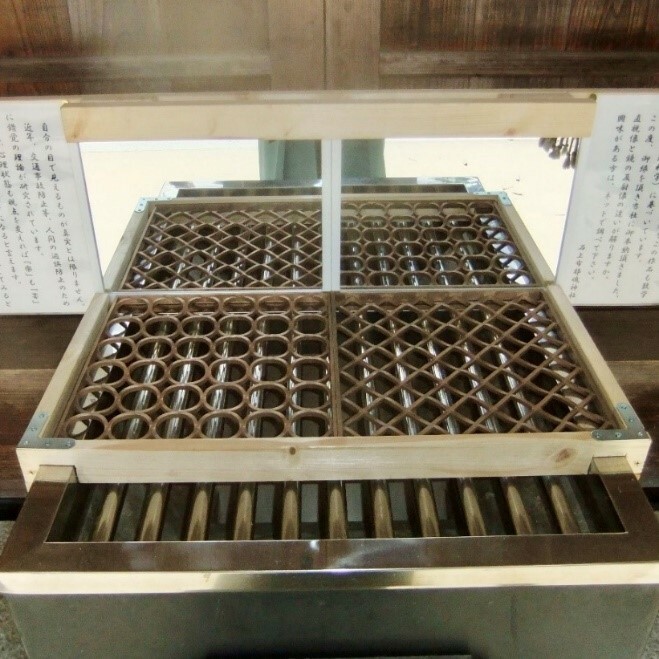 Traditionally, representative works of the time, such as wooden tablets called ema (with prayers) and sangaku (with geometry problems), were dedicated to shrines and temples in their anniversary years. For the upcoming anniversary, an optical illusion work was selected as an offering reflecting the modern age. The work to be dedicated is a bronze cast ambiguous object that changes its appearance in a mirror. It is one of the research results of the optical illusion team under the Private University Research Branding Project of the Ministry of Education, Culture, Sports, Science and Technology, Math Everywhere: Meiji University doing mathematical sciences, which is promoted by Meiji University. We found an ambiguous lattice that appears to be a circle lattice from one view direction but a square lattice from another view direction. As shown in the picture, if we stand a mirror behind this lattice, we can enjoy the two appearances at the same time, and have an impression that something impossible is happening. This can actually happen because of optical illusion. The object in this picture is a bronze lattice dedicated to a shrine for a top cover of an offertory box. Background Theory: K. Sugihara; Ambiguous cylinders: A new class of impossible objects. Computer Aided Drafting, Design and Manufacturing, vol. 25, no. 3 (September 2015), pp. 19-25.